Well, we're starting off with delivery this week but there really wasn't any way around it. Until I get this class thing over with, it's just a reality. I get home too late, cooking is not in the cards. Anyway, Meena was awesome enough to have some Joya waiting when I got home last night. A nice little spread of COLD items that weren't going to have any significant quality loss from sitting around a bit. Good idea, wifey. Good idea. Meena reports that she enjoyed her selections and I was pretty impressed with mine. The summer roll was odd in that it was HUGE and came served with some dijon mustard. Sorta strange. I mean, I guess because we've now been to Thailand for a few weeks and made it our business to eat everything we could get our hands on in that great nation, I feel like I have a slightly higher level of awareness when judging Thai food. And honestly, that whole mustard with summer roll thing was a new one. But not a bad one. Not at all. It was actually delicious and went really well with the carrots, shrimp and that soft and chewy wrapper. Nice call, Joya. Nice call. We decided to close out the weekend with a bit of steak and veg in the form fajitas. Not the most terribly original thing I know, but we had this bit of skirt steak and just figured ... why not? I really wanted a nice red bell pepper for this one but the stuff they had at the store was pretty over the hill. Meena's not a huge fan of green peppers so we finally opted for an orange. Not bad. I like my peppers and onions for fajitas charred a bit. Ours were to a slight degree, but I probably should have pushed them a little further. After lounging in that bath of flavor for the afternoon, I just pulled out the steak and got it sizzling on a skillet. The peppers and onions got a similar treatment with a bit of sea salt and olive oil. We served everything up with some tortillas, Florida avocado. a touch of sour cream and salsa. Delicious. The steak really took on those marinade flavors and shined between the layers of flavor inside each tortilla pocket. Pretty lovely way to close out the weekend. Our good friend Lopez had a birthday today and we tried to celebrate it properly with a dinner at our place and a few drinks in the hood to cap off the evening. I'm not sure about everyone else, but I felt it was a rather successful venture. We'd initially talked about creating fish tacos for the affair, but neither Meena or I were feeling all that hot so we just opted for a dinner that would require incredibly minimal activity on either of our parts. And for her cornbread, she just whipped up a bit of jiffy corn muffin mix (I won't front, this stuff is probably frowned on in many circles, but we use it often and hold our heads high) doctored with some canned green chilies. Delicious. I baked them for a couple hours and just applied the sauce in 15-20 minute bursts. Something like that. I just throw a little more on when I feel like it. Or when I remember. Anyway, they came out lovely. The ends were just a touch chewy and sticky from the sauce and the meat was soft and luscious. Fell right from the bone. Can you ask for anything more? The veg was out of this world. The liberal use of bacon took the sprouts, potatoes and onions to a truly special place. A warm and happy land of smoky, salty flavors for everyone. It's late. I'm getting a little weird. But the dinner was delicious and I think everyone had a good time. We're definitely doing our best to recover today and with any luck, these nagging colds will dissipate and we'll be back on our feet for this long work week looming in the not so distant future. Saturday morning. Man. Isn't it the best? There's nothing better than waking up and just lounging. Enjoying the sun pouring in through the windows. Eating food you probably shouldn't eat but you do anyway just because it's Saturday morning and you don't have to go to work. Or do anything. At all. Yesterday morning Meena ran out to take care of a couple quick errands and came back with two lovely bagel sandwiches. Sandwich feels like the wrong term here but I guess that's what they are. Technically. Whatever. She came back with some lovely bagels from Bagels By The Park. She had an onion and I had an everything. Sandwiched between the halves of these wonderfully doughy breads were copious amounts of smoked salmon, cream cheese, red onion and tomato. Mmmmmmmm. For lunch we went wandering around the hood and wound up at Ted and Honey over by our old apartment. I may have mentioned it before but Ted and Honey can be a VERY stressful place. What we had assumed was just opening month jitters would end up being just general disorganization that seemed to rear its head every time we stopped by. And honestly, we just never wanted to go back despite the fact they have simply awesome food. Because we watched these guys transform our corner from a nasty old deli to its current charmingly hippy dippy space, we wanted them to succeed. We liked their mission. We liked that they made all their own stuff. We liked all the stuff they were selling. We liked their vibe. We liked to say, "Man, wouldn't it be cool to do this someday?" But it was always so stressful in there! Orders seemed frantic, the physical layout seemed counterintuitive and there is something weird about the way you bus your own tables. Not that I mind taking care of my plate when I'm finished, there's just something stressful about where you place your stuff. God. I don't know. Maybe I'm just too critical. Probably. But I guess I just WANT things to be better there because I like the idea of this place so much. Anyway, my point of this long-winded rant is that when we stopped by for lunch at 4:00 on Saturday, there was NO STRESS AT ALL! In fact, it was totally rad. Smooth sailing. The clean up thing was still annoying. And the layout is still jacked. But because there weren't many people there, things just worked. And the food ... was glorious. Simply awesome food. My BLAT was one of the best I've had. Maybe ever. And Meena's Fidel had tons of pickles, cheese and luscious pork. One hell of a lunch. I'm a little ashamed to admit this, but I have to, for the third post in a row, offer another fake photo. This one comes courtesy of some dude on Flickr named jglsongs. Sorry for being a thief folks but I figured it was better than the grand total of ZERO photos I remembered to take when we actually got to Bar Tabac. See, part of the problem was that going to Bar Tabac was never our intention. We wanted to, after a moderately long week, hit Lobo for some margs and tex mex. Friday night, livin' right, you know? But when we got down there ... to our horror ... Lobo was in the midst of some renovation. Thinking about this a few days later, now possessing the ability to process their decision rationally, I get it. They needed to update some of that stuff. But oh, woe was us, friends. We were none too happy to be sent wandering Cobble Hill aimlessly. So with a hunger growing and no acceptable Mexican replacements in sight, we figured we'd just try the French angle. Or ... sorta French angle. Bar Tabac it would be. My salad was nice. Tuna, anchovy, potato, egg, etc. All things I love. And even cooler when they all make an appearance in my salad. Meena's mussels were solid as well. She was pretty pleased despite the fact they were fairly liberal with their use of rosemary in the dish. She's no big fan of the rosemary, baby, so it was a coup. A coup indeed. Similar to the previous post, I have some "fake" images up here. Unlike the previous post, I did actually take photos of this dinner, I just lost them. See, I was updating the firmware on my other camera and I was messing around the memory cards and ... well, the photos no longer exist. But it's Zaytoons and you've all seen plenty of images from Zaytoons. Nothing new to report really. Just a lovely little mix of appetizers for Alec and chicken shawarma sandwich for Meena. Can't ask for much more than that as you're breezin' into the final day of the work week. Wednesday night we hit Dan and Steve's for a few laughs, some Song (Park Slope's Joya) delivery and LOST. I didn't remember to take any photos, however, so you're only getting this shot from one of the last times we were over at their house and I DID take photos. Sorta like a place holder. Or like ... in old movies when they had that "scene missing" card. Sorta like that. Right? Anyway, I had some delicious pork and veggies in a ginger sauce. Lovely. Meena had some beef with basil. Great night. Fast paced week, this one. I guess we're just caught up in trying to right some some post-vacation pile up. Getting a few things knocked out that had been lingering and then taking care of the usual grind. And we've had things after work. So yeah. It's looking to be a long one. After I met with one of Allison's friends for a couple drinks, I got home just as Meena was welcoming in a bit of Cube 63. Thank goodness. And as if that weren't enough, I finally got to watch last week's LOST and 24. Sweet, sweet success. Monday night was bad. And the reasons that made it bad are lame at best. I readily admit this. But after a delayed train that put me back in Brooklyn well after 10:00 p.m., I just wanted to watch some TV and chill. Alas, LOST and 24 were not to be this Monday evening and I went to bed pleasantly full from some lovely Thai but decidedly unsatisfied due to entertainment malnourishment. It wasn't that serious. I'm just being sensational. Anyway. So Teeda was OK. I did get home way after it was actually "fresh" which is likely the cause of some quality loss. But I'm not sure the tom yum koong was very good at any point in its lifespan. The chicken shumai meatball things were sorta nice but maybe too large? I can't believe I'm saying that but it's probably true. The standout was the beef salad. Like my pork salad from Joya ... but dare I say better?!? I dare. You know how Hawaiians hand out those lovely leis filled with sweet smelling flowers the moment you step off a plane or into a lavish Maui hotel? Truth be told, I’ve never actually been so I’ve never experienced it first hand ... but I’ve still heard about it. Seen it on TV, you know. Magnum P.I. and stuff. Well, I had a similar experience when I landed in LA. Only instead of native island flowers strung together to form a necklace, I was taken immediately to In-N-Out Burger and handed a cardboard box containing some paper napkins, ketchup packets, an "animal style" burger and “healthy” fries. I have nothing against Hawaii and its customs, but the award for best welcome ritual most certainly goes to LA. No contest. While the fries were just a hair short of totally awful, these dudes made a fast food burger that erased any hint of travel fatigue and road weariness. Flowers are nice, but animal style rules. So that was our welcome. And our journey through LA and Venice only got better. Thursday morning Laura took us to this coffee spot on Washington and I can’t really remember its name. It’s the only one there. Anyway, I just had coffee, but Meena had her first of several Mexican themed breakfasts. This one was probably the worst one she had, but I’d say she was cool with it. Cool with the nourishment, anyway. Mr. and Mrs. Kaufman got dinner fired up on the grill and we were treated to an assortment of baked potatoes, grilled vegetables, flat iron steak and grilled tuna. The tuna got a lovely Italian marinade that injected some serious notes of garlic and balsamic vinegar and olive oil. Lovely. The meat had a bit of a peppery marinade and gave it a really nice bite. We finished dinner off with a bit of berry pie and vanilla ice cream that was worth every calorie. I know I sound pretty lame saying that but hey … I’m getting older .. I gotta watch it. Anyway, it probably wasn’t good for me but it was one hell of a slice of pie. Perfect meal. A few cups of coffee and an hour later and we were ready to explore. Sorry I don’t have photos of this one. I might later (took them with the film camera). Friday night we hit the lovely Primitivo for a selection of tapas that lived up to the hype Laura had given it prior to our arrival. We had some amazing bacon wrapped dates (MIDWEST STAPLE ALERT! ), a super bleu cheesy endive salad, a cured meat plate, kampachi crudo and fried calamari. I think the dates and the kampachi were the real standouts. Though the bleu cheese endive salad was pretty stellar. Saturday Laura took us on a tour of Venice that included this place Brickhouse Café or something. We had breakfast. It was OK. I think Meena had something Mexican again. The service was some of the most laughably terrible service I’ve ever had in a restaurant. And Meena lost her scarf there. But the food wasn’t bad. To make up for it, Laura took us to this place that serves mini-doughnuts. It’s called Zelda’s corner and it’s right off the boardwalk (which wasn’t a boardwalk where we were and I found that incredibly misleading, FYI). Now, I’m not a doughnut fan. Not at all. I actually hate them. I never eat them. But something about the fact that these dudes were hand-making these little bites of fried dough right in the window while you waited drew me in. I only had one. One was all I needed to recognize that if all doughnuts were like this one, I might actually like them. It was a weird little thing. It was still a little molten from the hot oil bath it had flailed around in just minutes prior. It was coated with cinnamon and sugar. It had elements of everything I hate about doughnuts but for one reason or another, I loved it. Also, I think it was like $3.50 for a dozen. Rad. The sushi was totally no frills. It wasn’t all packed up with spritzes of sauce and streaks of this and that. Just solid, delicious, FRESH, straight-forward sushi. I like. I like very much. Sunday morning, our final morning, we hit this joint called the Firehouse. It’s this strange combo of breakfast, lunch and sushi. I guess we were sitting in the breakfast/lunch zone. Sushi was on some other side of this gigantic space. I don’t know. I didn’t go look. I was just told. Anyway, Meena had this open-faced burrito type thing with all sorts of eggs and onions and cheese and salsa and chicken. It looked positively delicious. Laura and I both had a breakfast burrito with chicken. It was packed with eggs, chicken, sour cream and some salsa verde. Not bad. The real highlight, oddly enough, of The Firehouse was this chipotle garlic sauce they had on the table. AWESOME stuff. Just a subtle, smoky heat with a punch of garlic on the finish. Stellar. I forgot to ask if it was their blend or something they bought. It was in a squeeze bottle so the origins were shrouded in mystery. I guess I’ll never know. And I guess I’m OK with that. So as you can plainly see, we had an awesome trip. Great food, great friends, so so weather. Ha! We also had a bunch of wine, some late night Jack In The Box (yuk!) (we were drunk!) (leave me alone! 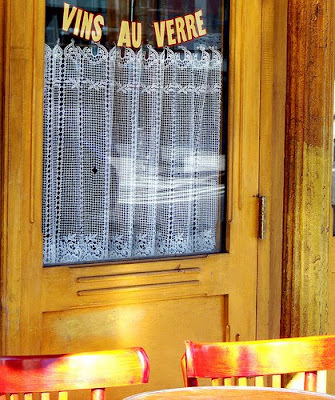 ), incredible macaroons from Jin, crap Mexican and a bunch of weird drinks from the Coffee Bean (when in Rome, right?). Thanks so much for taking care of us, Laura! Last dinner at home for a minute. We'll be in LA the rest of the week and I'm not sure how frequently I'll be updating. I hope to have a nice recap when we get back, but this may be hanging around at the top of the page for a couple days. I don't know. Maybe I'll sneak one in from LA. TBD. Anyway, last night we did a quesadilla that came out of a misunderstanding. I thought Meena said she wanted a quesadilla. She actually said fajita. Fajitas would have been better so I sorta wish that had happened. But whatever, these were cool, too. I started earlier that day by throwing the hanger steak in some marinade. A bit of tomato sauce, some sambal oelek, soy sauce, fish sauce and a bit of water. Nice. So I grilled that off and finished it in the oven and things came out really lovely. Medium rare in the center and crisp and caramelized on the outside. We finished them off with a bit of sour cream and salsa. Oh, and a touch more green onion for color and that raw onion bite. Lovely. The steak was awesome and packed with flavor. Took our regular quesadilla to a different level. We probably could have done a more elegant hanger steak presentation, but this was totally fine. And delicious to boot. I had class again last night so I didn't roll up on Brooklyn until about 9:45. Bummer. But when I got there, I was delighted to find my lovely wife waiting with a whole host of treats. Too many treats! She often has eyes bigger than her appetite and last night was no different. I love that though and I love the bits of leftovers I'll be able to pick through today! Oh boy. There was no way we were getting through those pitzas. Just too much. Meena wasn't a fan of the lahambajin, but I enjoyed the few bites I had. The shrimp was more to her liking. I was on board with it but I didn't LOVE it. Good not great. The sampler was rad. The cucumber yogurt was surprisingly even better as delivery than when I've had it there. Everything was good in the sampler, actually. My pita was dried out a little, but that was only because I probably got home 2 hours after it was first delivered. MY BAD. I think we might do a hanger steak tonight. One last cooking excursion before we head out west to see Laura! I'm happy to report we did quite a bit of cooking this weekend! I feel like with the last few weeks being insane in the office, we just haven't been chopping and roasting with frequency I'd like. But this weekend we made an effort. Partially because we're heading to LA this week and wanted to get rid of stuff in the fridge and partially because ... we like cooking. We started off the weekend with a trip back to 40 Verandah to pick up some old mail Pam had saved for us. While we were way over there in our old stomping grounds, we figured the best course of action would be to hit Bocca Lupo. We couldn't remember the last time we'd been and that was a problem. 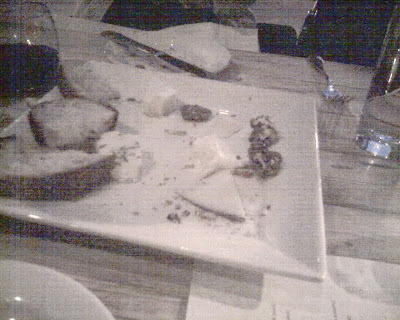 We started with their cheese plate and I have to say, this may be my favorite cheese plate on the planet. They really have some strong selections here and every time I try this thing I'm blown away by each and every offering. So good. And not terribly expensive. I didn't order that last one but they brought it by accident. Bank error in Alec's favor! We finished things off with the banana and nutella panini. Oh Bocca Lupo, I missed you so. I promise we won't go that long between visits again. I promise. Not bad. I forgot to spray my containers and the tortilla stuck. I just looked in the sink where they're soaking and it's STILL sticking. Mental note, spray them next time. PLEASE. But the sprouts were rad. Very rad. Not bad. We needed a little bread, but it ended up being very nice. Weird. A little. But nice. Lovely. The fish was cooked perfectly and we were really happy with the flavor the bacon gave to the fish when it cooked. I gave it a few turns on the stove then finished it under the broiler. Crisp bacon, perfectly cooked fish and a nice little bite from the mushroom and pea topping. Meena's salad was the perfect sweet companion to our salty bit of bacon and fish. Awesome dinner. After a lovely brunch with Dan at Buttermilk Channel, we decided to close out the weekend with a truly rich dinner - RIBS! Meena also made a little salad to go along with it. Came out perfect. Nice vinegar bite to go with the rich, sticky and salty ribs. I am SO glad it's Friday. It's been another really long week capping off about 14 days of constant insanity. So when I got home late last night, I didn't want to do anything. And fortunately, Meena was there with some Joya to help us ease into Thursday night. Actually, now that I'm looking back on it, it's not all that odd. I guess just the fact that I got woon sen was a bit of a departure from the norm. Anyway, sorry for the less than inspired posts this week. I'm hoping things pick up a bit next week if work will slow down a touch. At least there's the weekend! I'm not saying this is a bad choice. Cereal is one of my favorite things EVER. I'm surprised I haven't said that more on this blog. But it's true, I love it. This is one of those organic versions of Golden Grahams and it's pretty good. No Peanut Butter Bumpers, but pretty good. I got home a bit late last night so Meena got moving on some dinner. And guess what? It was awesome! They were delicious! Meena kept saying they were too stuffed, but honestly, that's sorta impossible in my mind. A fat quesadilla is a great quesadilla. Last night was weird. I was supposed to be at class but I thought I needed to stick around the office for a project that was later postponed. So ... nothing really went as planned. But I guess I made it home a bit earlier than I normally would have and that was nice. Although it wasn't the best thing ever, it also wasn't bad at all. It was 100% satisfying and I guess that's all I could ask for on a Monday night.